A breakdown of the essentials of cleantech venture capital investment. 2015 was an active year for cleantech venture capital investment, with $5.26 billion going into the market in the fourth quarter alone. With that in mind, investors are no doubt keen to learn more about investment opportunities in the space, be they in the form of venture capital or on the public market. Fortunately, a report from PwC illuminates some of the core trends in venture capital investment in the cleantech market. 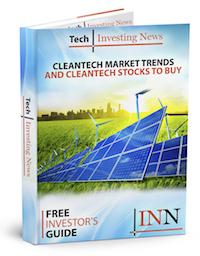 Here, the Investing News Network breaks down this data to illustrate how to invest like a cleantech venture capitalist. The PwC report looks at all of the major subsectors in cleantech: agriculture and bioproducts; energy efficiency; smart grid and energy storage; solar energy; transportation; wind and geothermal; water and waste management; and other cleantech. If that sounds like a mouthful, have no fear. While the cleantech market is broad and incredibly diverse, the vast majority of investment is concentrated in several key areas. For example, about a third of venture capital deals occurred in the solar industry in Q4 2015, while another third were concentrated in agriculture and bioproducts. Meanwhile, M&A activity was dominated by the smart grid and energy storage area, which saw 61 percent of the industry’s total mergers and acquisitions. While venture capital investment is largely grouped by subsector, it’s also geographically concentrated. If you’re a major cleantech venture capitalist, odds are that you’re located in Silicon Valley or San Diego. Indeed, in Q4 2015, almost a quarter of all venture capital dollars came from these regions. Silicon Valley was also a top area for deals during the period. Perhaps unexpectedly, New England was also a key region for cleantech deals. So what did these deals look like? There were fewer, albeit larger, venture capital deals last quarter, as compared to Q3 2015. A whopping 80 percent of total industry financing went to new projects, indicating that there are a lot of up-and-coming innovators in the cleantech market. The top earner on the cleantech venture capital scene in Q4 was undoubtedly Sapphire Energy, which brought in $92 million in financing. This San Diego-based company fits into the agriculture and bioproducts sector, as it produces crude oil made from algae. At $52 milion, Sunnova Energy saw the second-largest round of financing. The company is a Houston-based provider of residential solar systems. Neither company appears to have plans for an IPO in the immediate future. However, that’s not to say that the market was stagnant on the public side. Although funding in the public capital markets was significantly lower in Q4 2015 than it was in past quarters (it dropped 80 percent compared to Q3 2015), there were still some interesting developments. For instance, SunPower (NASDAQ:SPWR) saw a significant convertible offering of $400 million. Furthermore, SolarCity (NASDAQ:SCTY) received $113 million in private investment in public equity. From an IPO perspective, the space was relatively quiet. Only BuildingIQ (ASX:BIQ) went public last year, doing a $15-million IPO. BuildingIQ is an energy management software company that provides a web-based, software-as-a-service solution for energy use in commercial buildings. Its BuildingIQ platform uses advanced algorithms to fine tune and control heating, ventilation and air conditioning systems. Although the figures reported by PwC are more modest than those seen in previous quarters, there’s no reason for investors to worry about cleantech investment. With 100 deals executed in Q4 2015, the major takeaway is simple: venture capitalists are becoming more discerning about where they put their money, choosing to invest more heavily in fewer deals. And, although we don’t yet have the final statistics from 2016, it looks like this year is headed that way as well. The environment is at the top of everybody’s mind, when it comes to energy, innovation, politics and investing. There renewed primacy of cleantech in our global dialogue is cementing this market as one to watch. Overall, the solar energy sector and agriculture and bioproducts appear to be two of the most robust sectors. For investors who want to follow the lead of venture capitalists and become involved in these sectors, Bion Environmental Technologies (OTCMKTS:BNET), SolarWindow Technologies (OTCMKTS:WNDW) and Vivint Solar (NYSE:VSLR) all offer interesting opportunities in the public space. To keep up to date with Technology Investing News, follow us on Twitter @INN_Technology. This article was first published on March 23 on Technology Investing News.